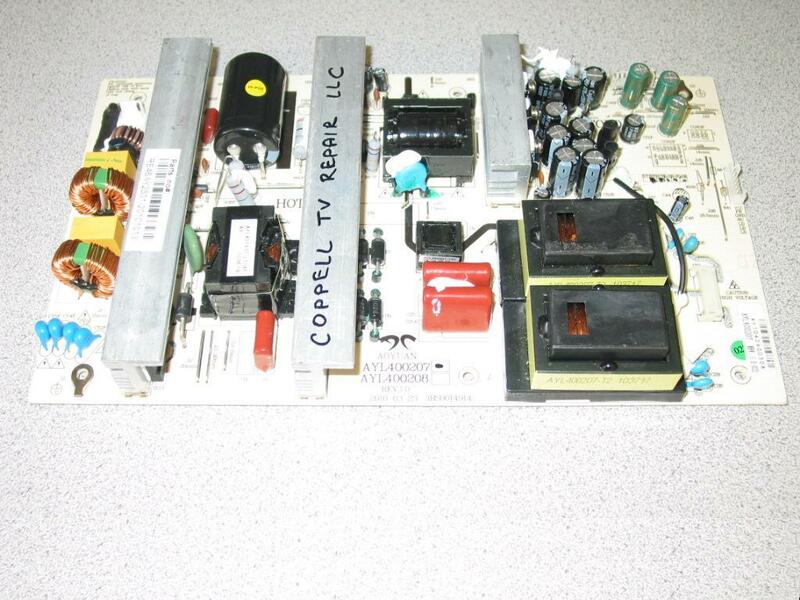 Q: Dear Coppell TV Repair, the TV you once fixed for us is still working fine - thank you for that! - but our recently acquired RCA 42LA45RQ stopped working last night and we are naturally coming back to you. The TV is less than a year old and has been working fine until last night when it suddenly turned black as we were watching it. Now every time we try to turn it on it only flashes for a second and then goes black. Sound is otherwise working fine. Can you fix that? Any advice is greatly appreciated. A: Well actually we can. We just can't keep up enough with the blog to post of all the findings we have. There is a known issue with the RCA 42LA45RQ resulting in just what you describe. Before I get any further I need to explain that like other low-cost brands (no offense meant, it's becoming more and more popular) the RCA 42LA45RQ is known to come in several different variants internally. If you dig a bit more around the net you will find that the same model yields several different options for the power board, for example. As of May 2013 we offer both a DIY repair kit for AYL400207 and a repair service for AYL400207. There is a good chance we might drop the repair service in future as other problems on the same board prove to be very difficult to isolate. 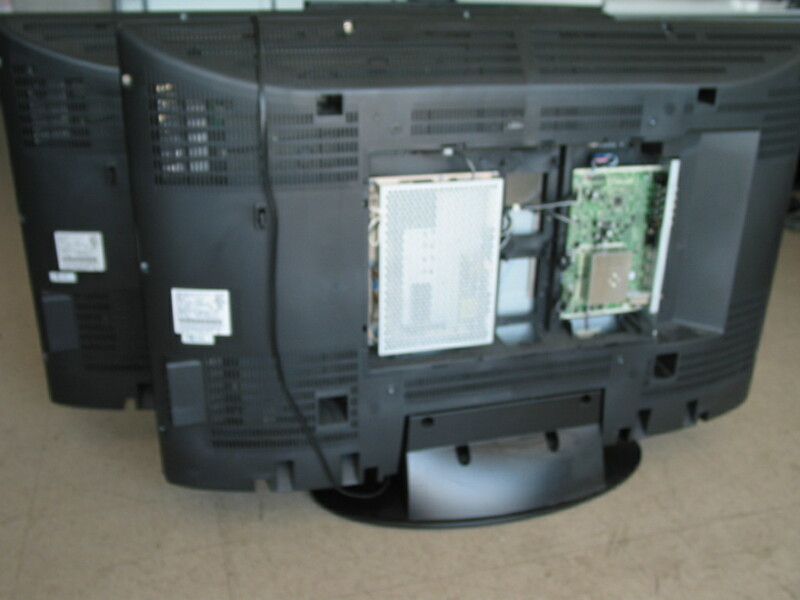 Coppell TV Repair now offers repair services for the below Sanyo LCD or plasma TV models. If you do not see your model on the list, follow this link to search our website as we may be already supporting it too! 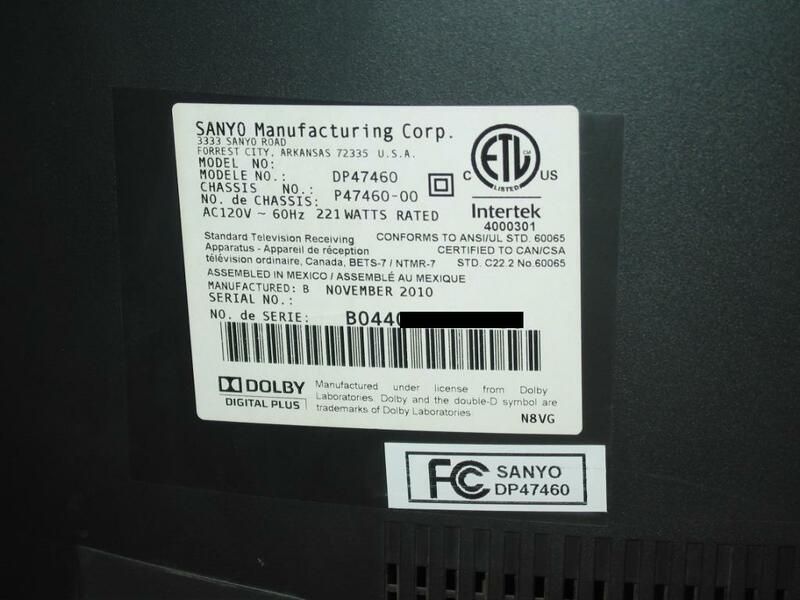 A few weeks ago we fixed a 52'' Sanyo with a problem in the main board for a local customer. The model was DP52449 and the problem was that when you turn it on it would never come up; the LED at the front would stay green for 5-10 seconds , then turn off for a second and then turn back green again for another 5-10 seconds and so on. A little Internet research would reveal that the issue seems to be widespread among those TVs. Resolving it took some time and resoldering on the main board with original parts from Sanyo (more on that later). 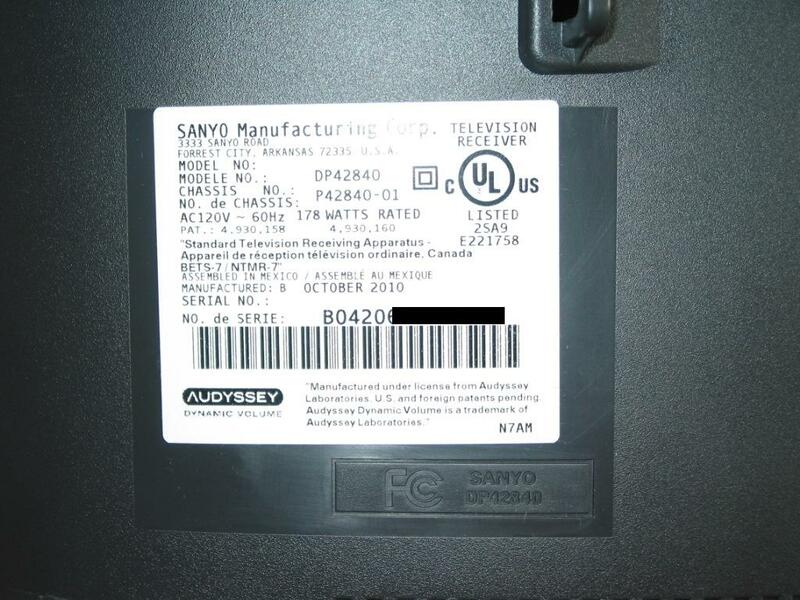 We haven't done a lot of Sanyo TVs before , but the news must have somehow gotten out because yesterday we were literally swamped with Sanyo LCDs of different makes and models - some with similar problems and some not so much. The situation may be familiar to others, but it is new to us, so I've taken the liberty to take a minute and just list them here. I may be posting individual hints and solutions later on, at the time I will just post the units that were brought to us in two days from end customers and local TV service centers along with the problem descriptions. I'm also posting the pictures of each unique unit's specification sheet as a proof that this is not just a shameless advertising, but an actual stampede of TVs at our service shop. Serial numbers have been manually removed on each picture. 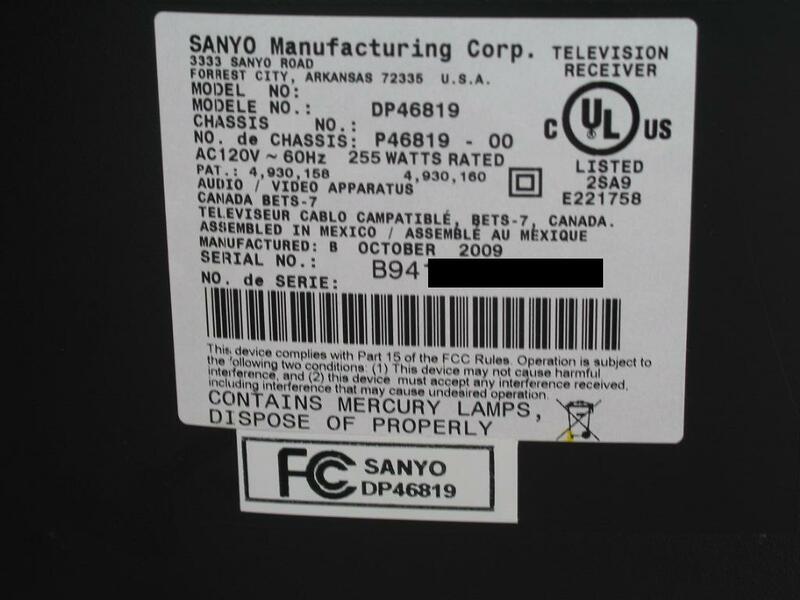 NOTE: if you have a Sanyo TV with a similar problem and you need a service please contact us via the contact form at http://www.coppelltvrepair.com and do not post comments here...at least at the time of posting this online we rarely have the time to check blog post responses. COMMENTS: Screen comes up at initial power on for a brief time and then the TV shuts off. 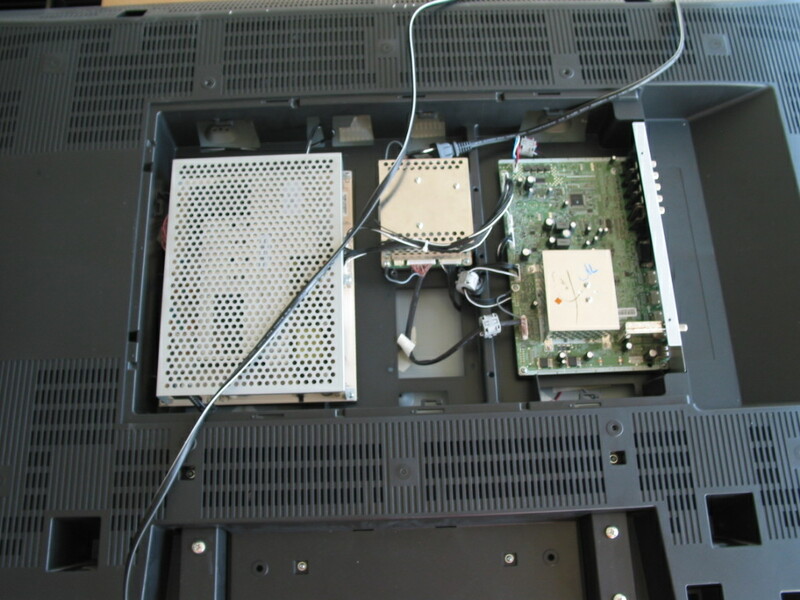 After three consecutive attempts the TV locks out and requires removal from AC power source in order to try turning on again, suggesting built-in protection. Such problems are commonly caused by 1) bad solder joints (especially in BGA ICs) , bad voltage stabilizers - be it in the power board or the main board itself - and messed up memory configuration, usually due to power surges. SOLUTION: In progress as of time of this writing. 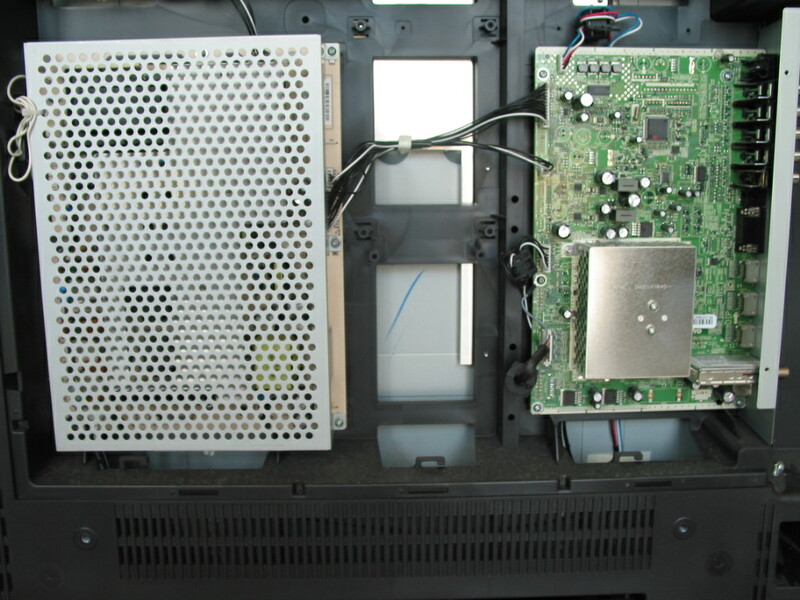 We were able to narrow it down to the audio tract by removing the voltage feedback protection for the audio tract, though, and got the TV to power on and operate reliably without sound. Clearly either the audio amplifier or the audio power step-down converter is at fault here. COMMENTS: This sounds and possibly is a variation of the above described problem. It is either bad power to the audio amplifier or bad amplifier itself. COMMENTS: We've got two of those in and they both do the same. 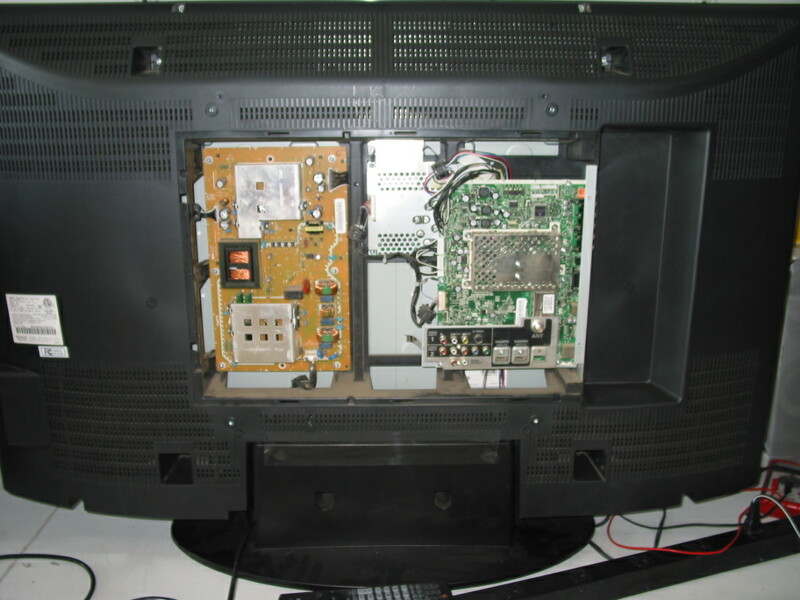 The problem is in the main board and requires precise component removal and replacement with an OEM Sanyo part. You won't find that component - and neither the board itself - at a chop shop like SJ or even official parts vendor like MCM - component level repair is the only option here and for the record that's not something that can be done at home and - in most cases - by field service technicians. 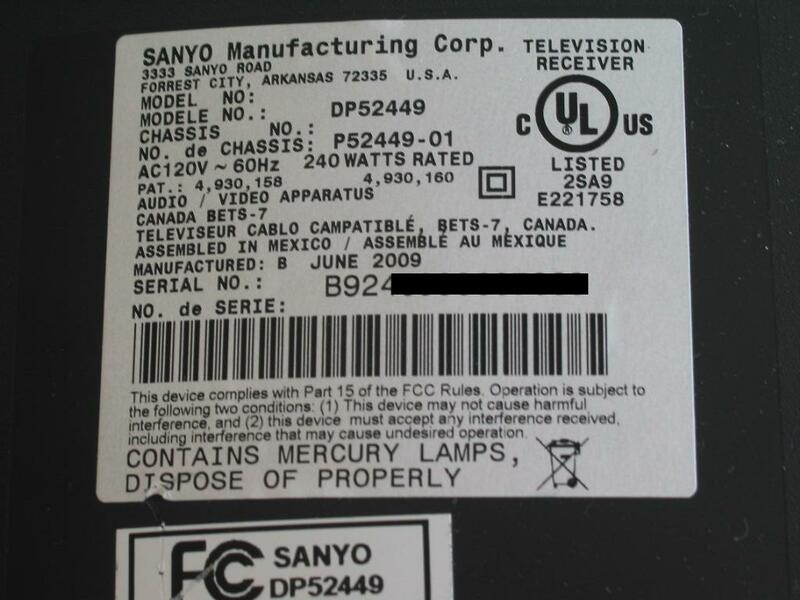 If your TV suffers from the same symptom and if you want to send us your board for service please use the contact/shipping instructions link at http://www.coppelltvrepair.com and make sure to include your TV model and serial number from the label as shown on the above picture. COMMENTS: There were two separate problems in this TV. One was that it would never power on completely, the back light would never activate and the front LED would only cycle. Fixing this required component level service of the main board. 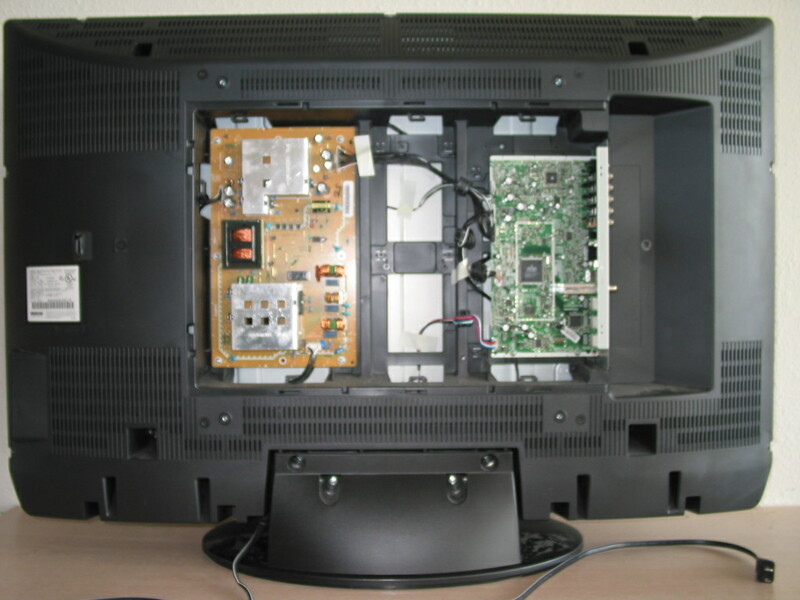 Upon completing the service the TV would come on with very loud and trembling sound, nothing like what it was supposed to. We are still looking into this as of writing this article. 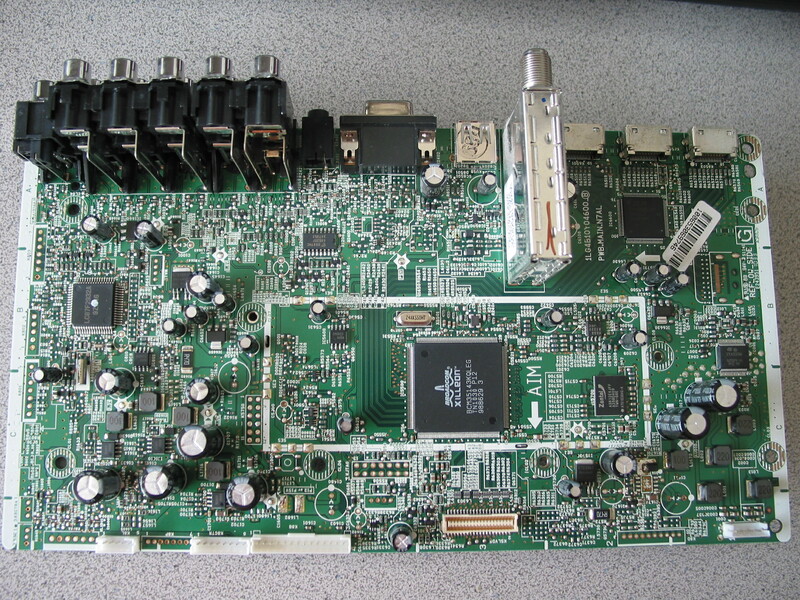 It is most likely bad audio amplifier since the power going to it seems to be correct. Update: problem was found and attributed to failed audio power amplifier IC or amplifier itself. 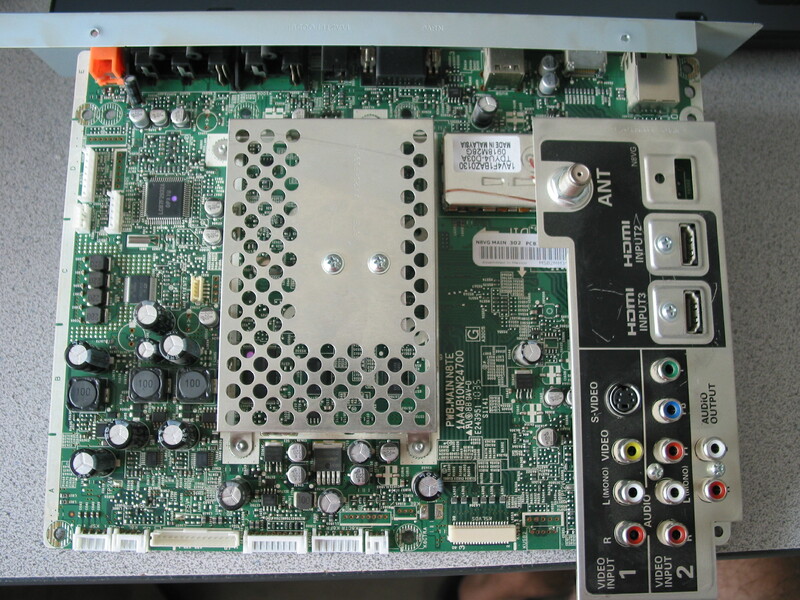 Our modifications of the main board increase the load the amplifier can take, but even with it we STRONGLY recommend that you do not play audio at more than 70% of the sound level bar.